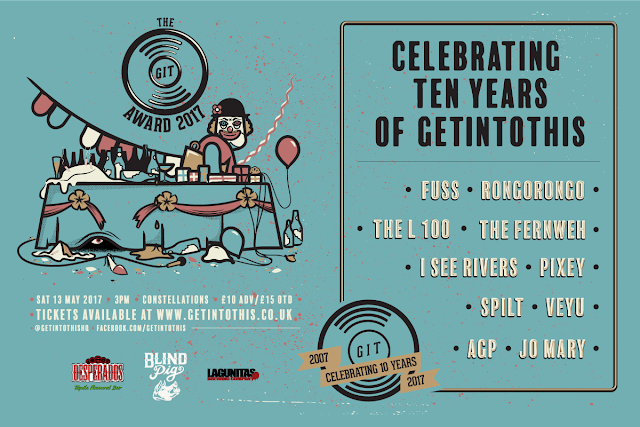 TEN of Liverpool’s best new bands will play the GIT Award alongside nominees on May 13 for a super all-dayer. Music web zine Getintothis have revealed details of a special happening to celebrate their tenth birthday, with ten of the finest new Liverpool bands set to play the GIT Award ceremony at Constellations on Saturday May 13 from 3pm til 3am. FUSS will be preparing for their appearances at this year’s Sound City and Psych Fest gatherings with an appearance at the party, while The L100 will be demonstrating why they are at the very forefront of Liverpool’s blossoming urban game as they bring their slick grooves and cutting bars to the proceedings having supported the likes of KRS One of late. Fresh from turning heads at Threshold Festival and Wrong Festival with their luring post-punk sound RongoRongo will be showing why they were nominated for last years GIT Award honours, with the six piece joining the rising psychedelic outfit, The Fernweh. Enchanting many at the Florrie at Greg Wilson’s chaos soaked 14 Hour Super Weird Happening recently and ready to cast his spell on FestEVOL Gardens, AGP has blossomed into one of the city's most intriguing prospects. Nordic songstresses I See Rivers will be casting their spell on the Baltic crowd and will prove why they were recently nominated for this year’s Glastonbury Emerging Talent Competition. Erupting under a wave of sunshine indie pop, Pixey will bring an eclectic mix to the party having recently wowed plenty with a stirring set at Live at Leeds. One time GIT Award nominees VEYU recently released an early contender for album of the year, further cementing them as one of the most integral acts in Merseyside music. Having decimated the Buyers Club and pretty much every other venue they have played, the frenzied grunge punk powerhouse that is SPILT will be primed to take Constellations firmly by the scruff of the neck, while the reverb soaked garage rock of Jo Mary will be the crowning glory of the event.